I haven't had a coupon blog, for as long as I can remember. I don't particularly identify with extreme couponing. In fact, If I am out and about I will typically use a coupon if I have one on hand, but never match sales anymore. UNLESS, of course it comes to CVS. CVS is my couponing dream come true. I'm not even exaggerating. It is by far the easiest place for me to save HUGE. I typically will only buy things that earn ECBs (extrabucks - store cash). I will save them and roll them on a deal combing other coupons in order to get items free, free earning ecbs (money makers), or super cheap. Now that I have Danny, and have to buy diapers all over again (and believe me, the prices in diapers have gone up A LOT since my oldest two were in them), I try EVERYTHING to save money on diapers, be it amazon warehouse boxes, coupons, etc. CVS is my go to lately though. Now, let me tell you my little secret. I used to have a mypoints.com account. I still do. I decided last year to re explore it, because it had been a while. Basically, if I search a merchant through mypoints, and shop online via mypoints, mypoints credits me x amount of points per dollar spent after up to 30 days. I mean, look at it this way, if you're shopping online anyway, why not earn points towards your purchase to later cash in on. They also have in store promotions from time to time, where you upload a receipt and can bank BIG points. I participate in surveys sometimes to earn points, or print coupons through them and they track the usage and credit me points for that as well, along with a plethora of other options. Once I have a certain amount of points banked, I cash them in for gift cards. 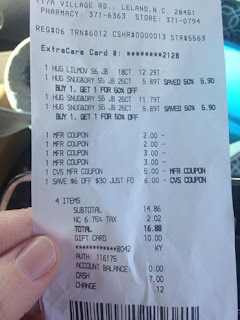 Here are some of my deals using coupons, ECBs and mypoints gift cards to show you examples of how I save BIG being a mom of 3. 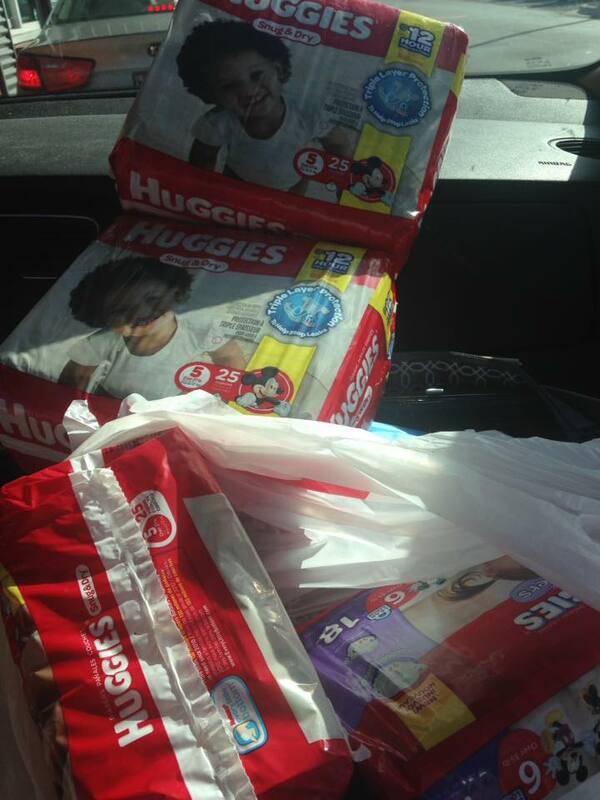 Huggies were on sale buy one get one 50% off. Now, I had (4) printable huggies coupons that I used through mypoints. 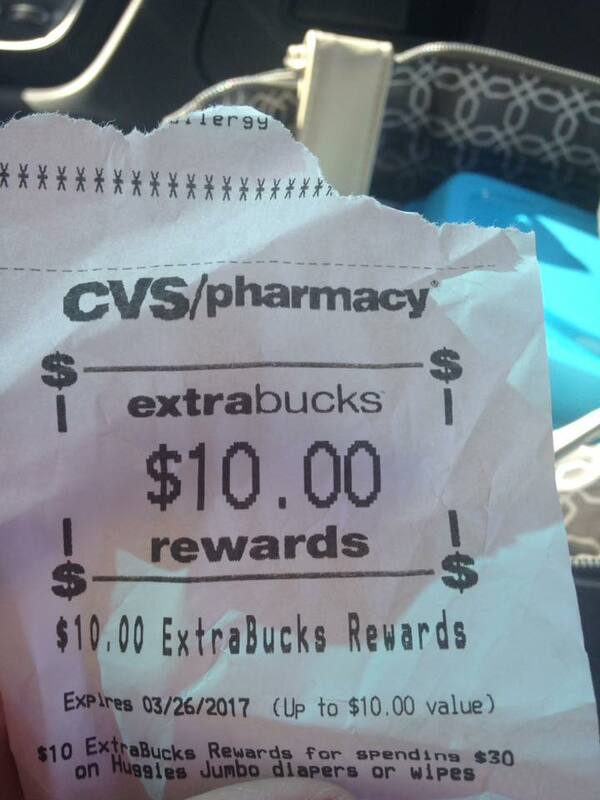 I then used a $6 off $30 purchase coupon that CVS emailed me. 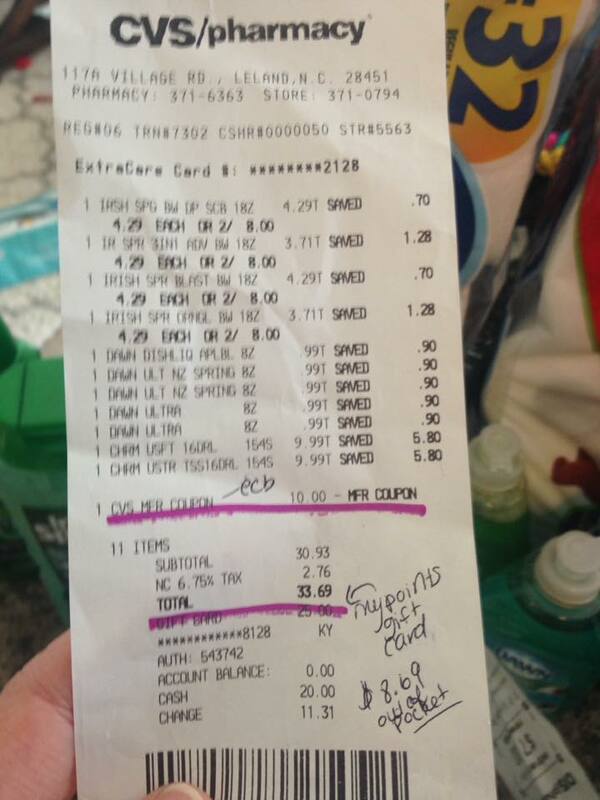 Now, check out my receipt and you will see the $10 gift card applied (that was an egift card from mypoints). The CVS extrabuck deal was, spent $30 on Huggies and earn $10 extrabucks. So, $10 - $6.88 is a profit of $3.12 !! 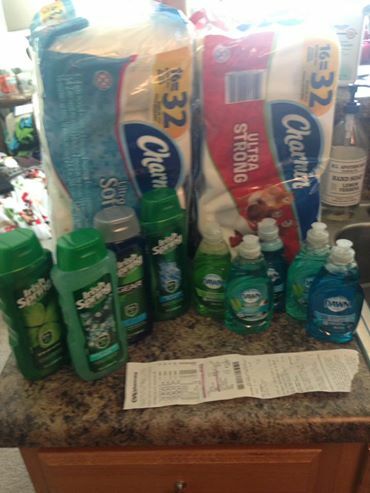 I walked out of CVS having made $3.12 for 93 diapers! Even Wal Mart can't beat that! CVS promotion of buy (2) Irish Spring body soap at 2 for $8 get back $3 ECB (I did this twice, since they have a limit of 4, and Stephen likes this body wash). So, $16. Now, on this deal, I earned $7 ECB for the Charmin and Dawn Deal and $6 on the Irish Spring deal, making me earn $13 in ECBs. $13 ECB - $8.69 out of pocket makes a profit of $4.31!! I'm sure I could have gotten this deal cheaper had I had manufacturer coupons on hand, but no biggie! 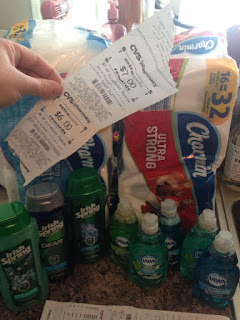 So in the last two weeks, I spent out of pocket $6.88 + $8.69 = $15.57 for all items picture above and STILL have $13 to spend! So it's like getting it all for $2.57. So, that being said, I have $13 in ECBs and I still have a $5 mypoints gift card left to spent. I see more cheap diapers in my future. 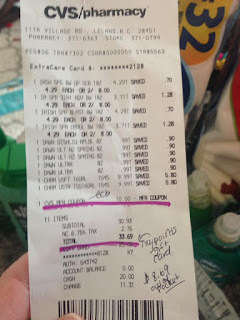 Tell me about your favorite couponing trips, dear readers!